Pomegranate jam recipes deliver the best of the whole pomegranate fruit by combining both pieces of pomegranate seeds and pomegranate juice to make this tangy and delicious jam. It’s absolutely gorgeous with a deep red to burgundy color and it tastes amazing! Did you know that simply by eating jam made from pomegranates on your baguette or homemade bread a few times a week that you’re taking in powerful antioxidants? Who wouldn’t want to enjoy this wonderful jam over green tea in the morning? Jam is easy to make using either a store bought 100% pomegranate juice or by squeezing your own fresh pomegranate juice from the fruit itself. You’ll want at least one fruit so you can toss a few seeds into the mix too. This beautifully colored jam is the perfect accompaniment to muffins, breads, waffles, ice cream, or any other food on which you enjoy jam. You’ll also enjoy giving away jars of this delicious concoction as gifts! 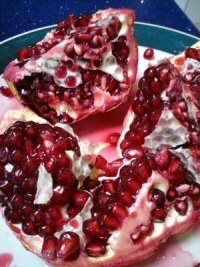 Take out the seeds from about 10 pomegranates. Put the seeds in a blender, so that the blender is full to the top. Do not throw away the remaining seeds. Pour the juice into a drainer. Add the sugar, vanilla sugar and salt stir and bring to a boil. Close the flame and add lemon. Take the seeds that were left and add and stir then put it into jars. Put it all into a pan and mix to combine and bring to a boil. Stir and allow cooling for at least 20 minutes before using. Transfer to containers and refrigerate. May last for at least 10 days in the refrigerator. 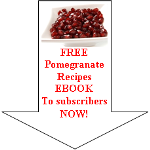 Read enough about jam recipes and want to discover more pomegranate recipes?